Mslexia magazine, ‘for women who write’, has a clear target audience and remit which marks it out from the other writers’ magazines. Aimed at women writers at the more serious end of the spectrum, this is not so strong on the commercial end of the market, but it does carry a lot of useful articles and has a distinct personality which marks it out from the others. MsLexia has a particularly clear and well thought through structure with a number of regular columns. The letters and other contributions are followed by longer articles, then there’s 15 pages of new writing, a creativity section and also useful listings. Advertising is relatively unobtrusive, giving the magazine a clean, uncluttered feel. The issues reviewed showed a clear practical approach in many of the articles. The ‘Insider Trading’ column had Matthew Hollis, a poetry editor at Faber, looking at what’s hot and what’s not in poetry, and subsequently Liz Smith, fiction editor of My Weekly, on women’s weeklies. ‘Making it pay’ dealt with volunteering as a way of getting your foot in the door, and running a venue. The column entitled ‘Ask the Expert’ gave some useful advice on decoding rejection letters and being pushy (about putting ideas to features editors). The most ambitious part of the magazine is the ‘Agenda’ section of longer feature articles, which dealt with a number of key issues for writers in an informed and readable way. Thus there’s Mslexia editor Debbie Taylor on ‘The next big thing: the Big Book and what might be in store for us in 2005’; ‘The small press revolution’; six literary agents’ predictions for 2005; ‘One hour a day’, on how to make progress with your writing if you don’t have much time; an interesting piece by Kate Clanchy on men and women’s poetry and the differences in the writing; ‘The Death of the hardback novel’; and ‘Secrets and Lies’, Justine Picardie on writing autobiography and the delicate balance between what you reveal and what you don’t. Lengthy author interviews included friendly and thoughtful discussions with Andrea Levy and Monica Ali, exactly epitomising the writing aspirations of the readers. In common with other writers’ magazines, Mslexia devotes a good amount of space to writers’ own work. 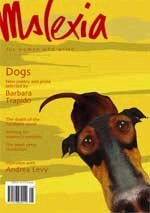 It’s more clearly set out with a clear theme though, in this case Barbara Trapido’s selection of new writing on the theme of dogs and the late Julia Darling’s selection on the theme of shoes. The quality of the writing chosen was impressive. More innovative is the six-page section on ‘Creativity’, which offers psychological analysis, advice and encouragement, including ‘Becoming a therapist for your characters’ and Wendy Cope on ‘Writing to length’. A generous book review section is followed by listings, a National Directory of calls for submissions and competitions, and also a regional directory. Although the final sections will not be of much use to non-British readers, the magazine as a whole is so consistent and targeted in its approach that women writers from all over the world would find much of interest and many would feel that its supportive approach is very appealing. My general conclusion was that for women writers who take their writing quite seriously and are aiming at the more literary end of the spectrum but who want good practical advice, offered in an accessible and friendly way, Mslexia is perfect. It’s not so good for genre writers and definitely not aimed at men, as many of the articles concentrate on the particular problems of women writers. Its clear focus makes for a consistent, enjoyable and high quality magazine, which many women writers would find supportive and encouraging.